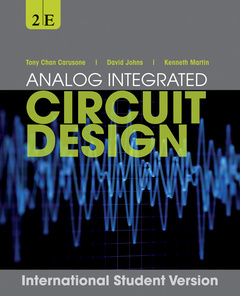 When first published in 1996, this text by David Johns and Kenneth Martin quickly became a leading textbook for the advanced course on Analog IC Design. This new edition has been thoroughly revised and updated by Tony Chan Carusone, a University of Toronto colleague of Drs. Johns and Martin. Dr. Chan Carusone is a specialist in analog and digital IC design in communications and signal processing. This edition features extensive new material on CMOS IC device modeling, processing and layout. Coverage has been added on several types of circuits that have increased in importance in the past decade, such as generalized integer-N phase locked loops and their phase noise analysis, voltage regulators, and 1.5b-per-stage pipelined A/D converters. Two new chapters have been added to make the book more accessible to beginners in the field: frequency response of analog ICs, and basic theory of feedback amplifiers.